WASHINGTON (AP) Washington’s Bradley Beal says he’s playing with less stress since making his first NBA All-Star Game. The way he shook off his miserable start on Thursday, he might be onto something. Beal scored 25 of his 27 points in the second half, helping the Wizards to a 122-119 victory over the Toronto Raptors. The Wizards had eight players score in double figures in their third straight win without All-Star point guard John Wall, who had surgery on his left knee on Wednesday. 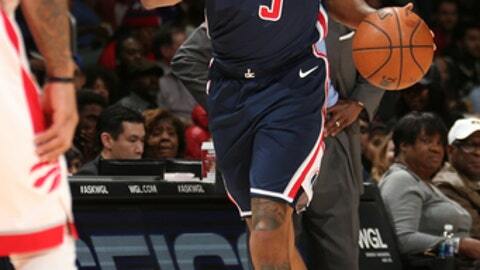 Otto Porter Jr. had 16 points and 11 rebounds in his first double-double since early December, and Markieff Morris scored 15 points – including five straight in a stretch that gave Washington the lead for good in a dogged battle against the second-place team in the Eastern Conference. Kyle Lowry scored 17 of his 29 points in the fourth quarter for Toronto, but missed two late free throws. All-Star DeMar DeRozan added 23 points and Serge Ibaka had 16 after a potential tying 3-pointer rimmed out late. Morris capped a 9-0 run by hitting a pair of free throws and then a baseline 3-pointer off Porter’s feed to put Washington up 115-110. From there, the Wizards hit seven of their last eight foul shots to seal the game. Lowry hit a spinning runner to cut it to 118-116 with 11.6 seconds left, but couldn’t convert the three-point play. Then with 3 seconds left and Toronto down 120-118, Lowry reached a loose ball off Washington’s inbounds and got fouled, but missed the first of two foul shots. Raptors: F/G C.J. Miles (sore right knee) missed his second straight game. … G Fred VanFleet did not play due to personal reasons. … C Jonas Valanciunas is 5 for 6 from 3-point range over his last four games. He went 2 for 2 twice in the first two games with multiple 3s in his career. Wizards: G Jodie Meeks scored each of his 10 points in the fourth quarter, posting double digits for the first time since Dec. 29. … Tomas Satoransky started his third straight game at point guard in Wall’s absence, a stretch that equaled his previous career starts total. … Coach Scott Brooks received a technical foul moments after the halftime buzzer. Former Washington and Toronto G Rasual Butler was honored with a pregame moment of silence. Butler and his wife died in a single-automobile accident in Los Angeles on Wednesday morning. He was 38. DeRozan was named the NBA’s Eastern Conference Player of the Month for January after averaging 25.3 points and 5.9 assists. DeRozan’s full-court inbounds pass to end the game was intercepted. But he completed a similar heave that nearly led to points at the first-quarter buzzer, and said afterward it’s a skill he’s always had. ”I’ve been a black Tom Brady for a while now,” DeRozan deadpanned. Raptors: Start a four-game homestand Friday against Portland. Wizards: Play six of their next seven on the road, beginning in Orlando on Saturday.